Dear White People takes place at a fictional Ivy League university, where — in one way or another — just about everyone can be considered privileged. But rarefied Ivy air doesn’t necessarily shield students from hypocrisy, prejudice and even racism. Education, we’re reminded, doesn’t automatically equate with acceptance, tolerance and an open mind. Writer/director Justin Simien may have had that unfortunate reality in mind when he wrote Dear White People, a movie that does a commendable job of introducing audiences to the pressure cooker environment that surrounds young black people at major universities. Simien runs his finger across racial fault lines, showing us that post-racial bliss remains more dream than reality. Set on the campus of Winchester University, Dear White People (the name derives from an in-film radio broadcast by one of the students) isn’t only addressed to white people. Simian points a satirical saber at whites and blacks, basing a key event in the movie on recent news reports about real college fraternities that have held parties in which white students mock what they see as black styles of dress and speech. Episodic in approach, Dear White People focuses on a variety of characters, each dealing with a different level of racial tension and personal expectation. Brandon P. Bell plays Troy Fairbanks, a black kid who happens to be the son of the school’s dean of students (Dennis Haysbert). When we meet Troy, he’s dating a white girl (Brittany Curran), who’s the daughter of the school’s president (Peter Syvertsen). We also meet Coleandra “Coco” Corners (Teyonah Parris), a young woman of unconcealed — if not entirely thought-through — aspirations. Then there’s Samantha “Sam” White (Tessa Thompson), a modern-day militant who wants to return one of the school’s diversified houses (club-like places where students gather for meals) to its all-black roots. Surprisingly, she’s elected head of the house, beating out Bell’s Troy, a young man who seems to embody acceptability and poise, but who has his own issues. Sam’s also sleeping with a white student, which is less a sign of hypocrisy than a way for Simien to remind us that things usually are considerably more complicated than they appear. The movie’s resident outsider role goes to Tyler James Williams, who plays Lionel, a gay student with a beach-ball sized Afro and a taste for Robert Altman movies. Lionel watches everyone without really fitting in anywhere, until he finds a niche of his own. Simien includes a fair amount of what you might call cultural confusion. Black students reject stereotypes, but often find themselves attracted to things they may think they should be avoiding. At one point, Sam — a film student who made a satirical short called Rebirth of a Nation — is called out for listening to Taylor Swift. Kyle Gallner plays the most obnoxious character, another child of the school president. Gallner’s Kurt Fletcher also heads the campus humor magazine. It’s a little difficult to believe that two of the school president’s kids are involved in the plot, but Simien uses these young people to point out disparities (some petty, some not) between black and white students. Simien probably takes aim at too many targets, including mainstream cinema, which doesn’t make much room for black stories that aren’t either historical or hood-based, but this is a first feature and you can forgive Simien’s need to say as much as he can. 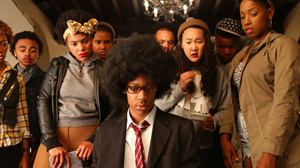 The story culminates with a fight at a costume party at which white students don blackface and mimic black styles (or their idea of black styles) which they seem to find amusing. Although all of the main characters have their own arc, it’s pretty clear by the end of the movie that the circumstances in which they’re struggling with identity issues haven’t changed much. Watching Simien’s Dear White People, I couldn’t help thinking back to Spike Lee’s School Daze, which dealt with students at a black college. That movie came out in 1988. Twenty-six years later, along comes another talented filmmaker to take our racial pulse, and remind us that it’s still subject to an irregular beat — sometimes funny, sometimes heartbreaking, sometimes hurtful, but one we definitely shouldn’t ignore.